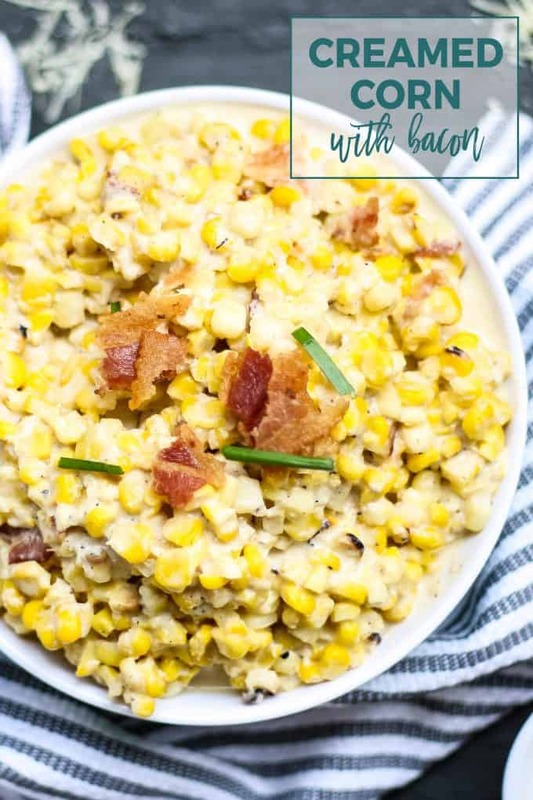 If you find yourself with leftover corn on the cob, make this recipe for roasted creamed corn with bacon. The perfect corny combination of cream, salt and bacon. Mr. B’s career is one that has him working really messed up hours. Usually he works from 3-11pm and occasionally does some overtime, which means long shifts and weirder hours. For the most part he has Sundays and Mondays off, which is nice – we can enjoy Sunday Funday with our friends if we want to and then have Monday to relax at home together. Back when I was working in the restaurant biz, I made sure I always had Sunday evening and all of Monday off. I often felt like if I didn’t do that, we would never get a chance to spend time together. Now that my schedule is flexible, I have tried to keep up some of the tradition we started. One of the things we try to do every Monday is grill. Obviously we don’t do as much of this in the winter – even though Mr. B would grill in a blizzard if he could find the grill. But from about April to early November we are grilling every single Monday, and occasionally even on Sundays. When we do the grocery shopping together, Mr. B. loves to go through the corn in the fresh produce section. I don’t know if other grocery stores do this, but ours keeps one of those huge 50 gallon garbage pails next to the fresh corn so us shoppers can find the freshest corn. He loves corn roasted on the grill – sometimes he gets excited and buys too much. This easy side dish is perfect for holidays like Thanksgiving, Easter or Christmas. It’s very easy to double or triple and your guests will enjoy it. 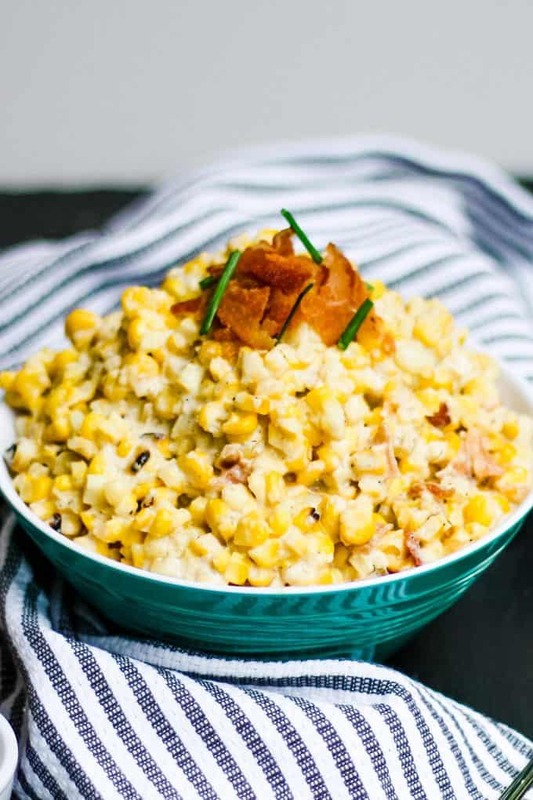 I have heard it’s the best easy creamed corn recipe and I’m not going to argue with that. 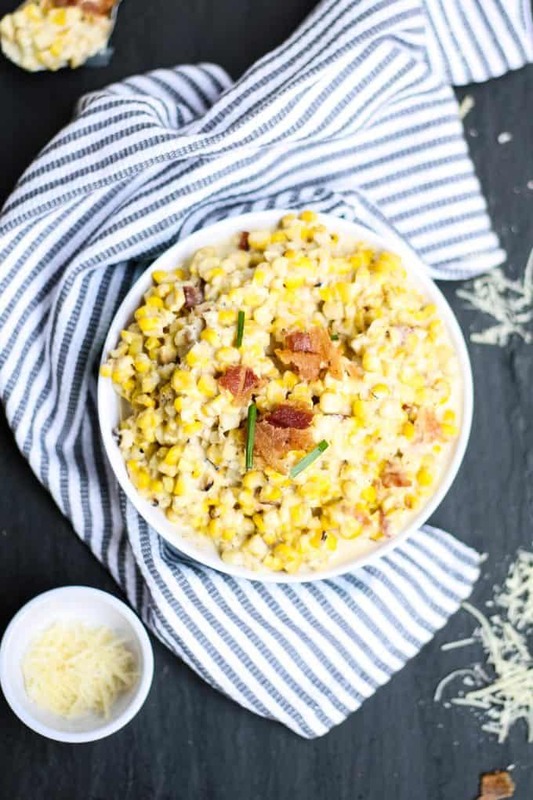 This recipe is perfect for leftover corn on the cob. All you have to do is cut the corn right off of the cob into a measuring cup and then throw it into a pot. I used 4 corn cobs for this recipe – depending on the size of your corn cobs, you may need to use more or less. You can usually cut off about 3/4 of cup from each corn ear but my car cobs were a little small. I also made sure that the corn was cooked on the grill directly, and not just through the husk. I think this gives a little smokiness to the cream corn. And my favorite saying is, “Everything is better with bacon.” I’m a dream come true to a pork farmer. 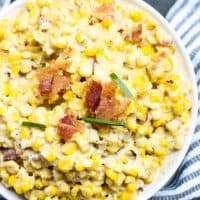 Can I use canned or frozen corn? If you want to use canned corn, use a 16 ounce can and drain it well. If using frozen corn, make sure it is completely thawed before beginning. Depending on how you thaw the corn, you may need to drain any liquid that melts from the frozen corn. Combine the corn, half & half, butter, Parmesan cheese, salt, and pepper in a saucepan over medium heat. Cook for 20-25 minutes, stirring occasionally. Corn is done when the butter is melted and the liquid has reduced by a quarter. Turn off heat, add bacon, and stir. Originally published June 2014, updated March 2019. My goodness! This looks and sounds yummmmmyyyy! I think I might make this for my next family gathering! You will love it! My husband said he wants me to double the recipe next time I make it, so keep that in mind. Thanks for stopping by! Oh, this looks so amazing. Thank you so much for sharing the recipe. This looks and sounds so delicious! I love how easy it is to make. Any time we’re grilling corn on the cob for dinner, I’ll have to remember to throw some extra on the grill to make this. This sure sounds and looks great. Thank you for sharing this recipe with us. Oh my goodness! This looks delicious!! And I don’t even like corn! This looks delicious! Could you freeze this so you could have it in the winter months? Hi Patti – I am not sure if this can be frozen. I will be remaking it soon to update the photos and will try then and update the post. I made this using frozen roasted corn from Trader Joes. Delicious. This looks amazing. The corn on the Cobb at my local grocery looks awful right now. Can I “roast” thawed frozen corn some how? 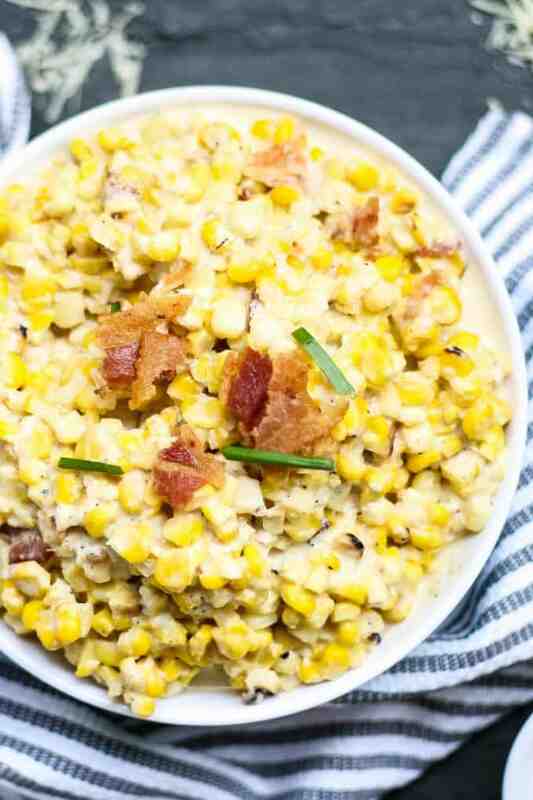 I don’t think so BUT I’ve seen frozen roasted corn in the freezer section that would be perfect for this recipe.